[Interview] BAND-MAIKO "Maid Costumes, Maiko Outfits, and Japanese Culture." This is a translation of an article that was published in BARKS. For April Fools' Day 2018 BAND-MAID announced that they were changing their name to "BAND-MAIKO." 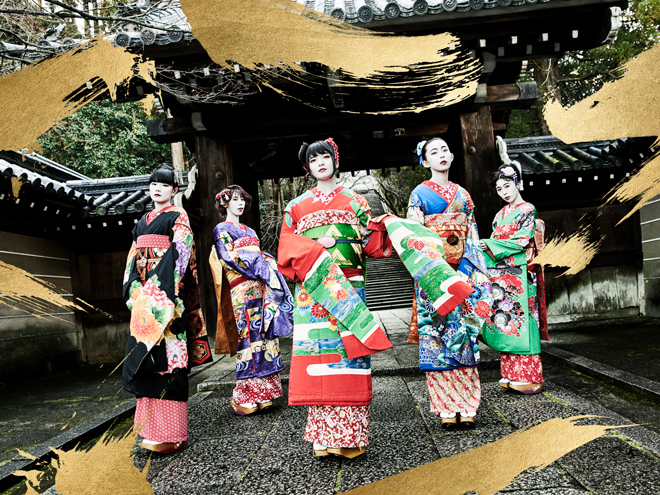 First they put out a music video dressed in maiko (apprentice geisha) outfits, and then later in 2019 they officially introduced themselves to their shocked fans as BAND-MAIKO. Their new original song "Gion-cho" is going to be featured on "BAND-MAIKO," the 1st major mini album under their new band name. It's set for release on April 3rd. The concept behind it is summed up as "Maiko x Hard Rock." For these new songs they brought out traditional Japanese instruments to create a festive and elegant Kyoto-inspired sense of style, which offers a fun and interesting contrast to BAND-MAID's previous work. The songs come together with a perfect blend of rock and maiko-style spirit. The 5 of them look poised to take the world on while they don both maid costumes and traditional maiko clothing! ■Expressing the splendor of maiko with "Gion-cho"
──So after 2018 came to an end you got started with BAND-MAIKO. And at first it was it was just something that came together for April Fools' Day, right? Hatoko (Miku Kobato): Yeah, exactly. 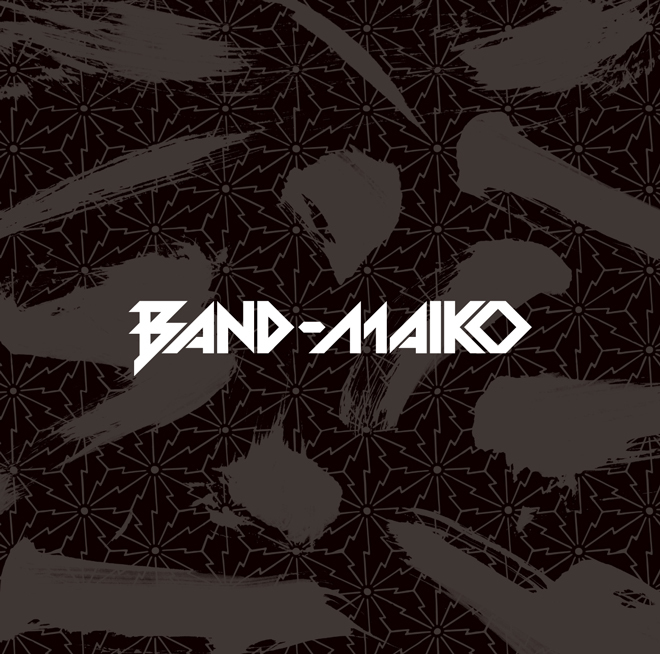 In 2018 we announced that BAND-MAID was breaking up and our new band would be called BAND-MAIKO. We figured it would be a good way to truly surprise our fans for April Fool's Day, but after we saw the excitement it ignited we thought that maybe we should actually do it for real this year. From there we decided to release a mini album. ──In 2018 you released a music video called "secret MAIKO lips," which was a Japanese-style rendition of BAND-MAID's song "secret My lips." 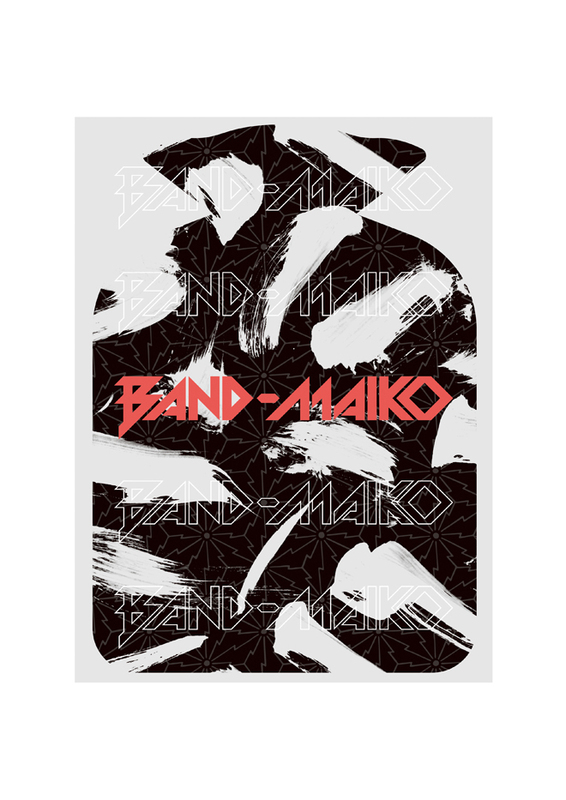 Now that the song is available as well, it looks like BAND-MAIKO has created quite the sensation, don't you think? Hatoko: Oh yeah, I certainly think so too. A lot of people really believed us when we changed our name. Akatsuki (Akane): Even people in the industry were like, "So you're BAND-MAIKO now, not BAND-MAID?" There were all of these people that thought it was real and I would have to explain, "No, it was just a thing we did for April Fools'!" (laughs). ──Hahaha! That's amazing. It looks like a lot of people really fell for it. Hatoko: We really had them going (laughs). So we were thinking that this year we should continue on with the fun surprises. ──Did you try performing with the maiko outfits on to get a sense of what it's like? Hatoko: It turns out that the clothing that maiko wear is actually very heavy. That added a lot of difficulty. Especially when it came to playing the drums. Akatsuki: I couldn't even lift my arms up! Hatoko: You had to completely roll up your sleeves just to play. Akatsuki: I was playing slower and stuff like that since I couldn't step down on my double pedals. ──Those clothes sound really hard to get around in. But, you still managed to put to together the mini album "BAND-MAIKO," which also includes "secret MAIKO lips," as well as "Gion-cho," the original song you did as BAND-MAIKO. Kanoemi (Kanami): At first we were thinking that we should do new arrangements of BAND-MAID songs like we did before. But then we thought why not just come up with entirely new songs instead. So, we talked it over and got to work on the new songs. The song "Gion-cho" doesn't really sound like Kyoto in terms of melody. BAND-MAIKO came together musically by adding the sensibilities of traditional Japanese instruments to our band's sound. Hatoko: And through that we took on a certain atmosphere with Kyoto and maiko in mind and expressed them through the lyrics. ── Words from Kyoto dialect like "Okoshiyasu" (welcome) and "Okini" (thanks a lot) are delicate sounding, but they also bring to life that sense of elegance maiko are known for. The expressions might be different, but in spirit they also seem to offer a source of connection. Hatoko: The lyrics for each song on this album were written with Kyoto dialect. The other song that was based on a previous BAND-MAID composition was already written, but "Gion-cho" marked the beginning of the writing process for this album. I wanted to weave in words like "Ozashiki Asobi" (maiko activities like singing, dancing, etc.) and "Senjafuda" (paper slips posted on temples and shrines), which reflect the specific culture and language of maiko. ──The journey to becoming maiko, with their strict training and etiquette, must be a tough one. Hatoko: I certainly think so. A lot of them in Kyoto start training at 15 or 16 to become maiko, and then the from there they work toward becoming a "geigi" (another term for geisha). I really got a sense of how demanding and important their work is when it comes expressing emotion and being resolute, so I wanted to showcase the splendor of maiko with "Gion-cho," and find a way to express their emotions and elegant mannerisms that tie so closely to traditional Japanese culture. Fujiki (Saiki): I would say that this one really gets in touch with the world of maiko, especially when you compare it to the other songs. That same nuance comes through in the other songs we did as BAND-MAIKO as well. The recording process felt very different from what we do as BAND-MAID. I sang my heart out for these songs, but at the same time I was singing lyrics inspired by Kyoto dialect, which capture the exclusive setting that maiko inhabit. That sense of Kyoto-style elegance and composure kept me from overdoing it with the vocals. ──There is a real sense of romance in your voice. Fujiki: (answering with a cool expression) I'm glad to hear it (laughs). Umemisa (Misa): For the melodies we went in for a strong impression with faster tempos in certain parts, so I plotted it out to keep the base lines the same way. Akatsuki: For drums in BAND-MAID I used the double pedal a lot to keep a double beat. I usually play with a fierce and intricate style, but this time around I tried using the cymbals and stuff like that to get a more festive sound. This was the first time I played a double beat like that. It felt really fresh and interesting. ──You put together a music video as well? Umemisa: We shot it on-location in Kyoto. Akatsuki: We went out to all of these famous sightseeing spots. Umemisa: We got to go to a garden too. There's some stuff we got to shoot on our own too, like some footage from up high on Ninenzaka lane with the 5-storied pagoda right in view. Hatoko: There's some footage with Kanoemi playing in the bamboo forest. I was shooting this one part along a road that's frequented a lot by maiko, and there were actual maiko walking right nearby. Kanoemi: They were looking at her like, "Hey, who is that girl?" (laughs). Hatoko: Yeah, they had this look of wonder about us. We shot the whole thing with the utmost respect. So, whenever we ran into actual maiko we made sure to be nothing less than kind and courteous. Fujiki: The whole band got to shoot a performance at a temple. Hatoko: We got to film the scene right on the temple grounds. I felt like we were doing the Kyoto version of the video we shot for "REAL EXISTENCE" (2015) under BAND-MAID. Fujiki: It was all lit up with lights. It was so pretty to see. It wasn't just at night either, we went out in the morning to shoot at lots of different locations. We did the traditional tea ceremony too. Umemisa: Hatoko was doing all of the proper etiquette involved in tea ceremony for us, but for some reason Akatsuki was the only one who had soba noodles instead of tea in front of her. Hatoko: We also had a soba eating scene in the video for "secret MAIKO lips," so it was like episode 2 in the story (laughs). Fujiki: Akatsuki is a huge fan of noodles. Akatsuki: I even took the leftover soba with me after we were done.